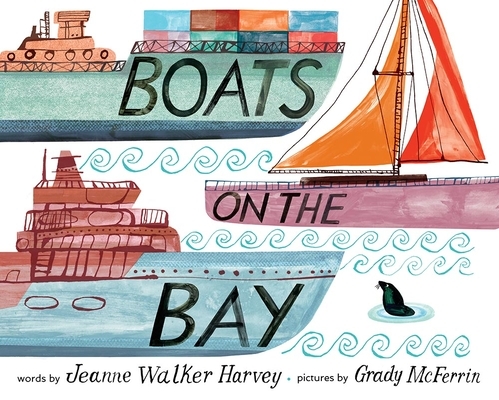 Jeanne Walker Harvey lives in Sausalito, California, where she watches the boats on the bay from her house on the hill. She is the award-winning author of several picture books, including Maya Lin: Artist-Architect of Light and Lines; My Hands Sing the Blues: Romare Bearden’s Childhood Journey; Honey Girl: The Hawaiian Monk Seal; and Astro: The Stellar Sea Lion. Harvey also serves as a docent at the San Francisco Museum of Modern Art. Grady McFerrin is an illustrator, designer, and hand-letterer who lives in Los Angeles with his wife and two children. His work has been featured in the New York Times and the New Yorker, as well as in children’s and gift books, advertisements, and music posters, and has been recognized by the AIGA, Communication Arts, the Society of Illustrators, Print Magazine, and American Illustration. This is his first full-length picture book. "A well-designed book with a simple, approachable text." "Simple, serene text coupled with stunning, sweeping illustrations." "This is McFerrin’s debut picture book. . . .He manages to capture textures you want to reach out and touch." "Harvey’s short, simple sentences, many with internal rhymes . . . make this a good fit for emerging readers." "A celebration of place and a catalogue of the kinds of vessels dear to the hearts of boat enthusiasts young and old." "This mini intro to our safe harbor is perfect run-up or follow-up for a leisurely stroll along the Embarcadero, bracing bike ride across the Golden Gate Bridge, or ferry tour around Alcatraz. Take-home message: Take notice."